The next wave of talent will be on show from this weekend, when the division two NAB AFL Under-18 Championships get underway. Here are some players from each of the four teams to keep your eye on throughout the three-week carnival and as the season progresses. "Harry predominantly played as a defender as a junior so has always seen the game in front of him, but he's moved into the midfield and has been a revelation in that role given he reads the game so well. He's been exposed to a lot of senior footy through Collingullie and he's moved from playing as a permanent back pocket into a midfield/forward role this year. He's a good user, a smart kid and doesn't get stressed by too much." "Kobe looks like he's really grown in his physical and athletic ability. He looked really balanced at our recent camp when the ball was moving up and down the ground. He's a ball magnet who can use both feet, and he impacts the game through multiple possessions. He played championships last year but is more mature about his role this year and how he sees himself performing among the group." "A midfielder/defender who can be used as a utility. He shows a high level of endurance and reads the game well. He's a good ball user and is adaptable enough to play in a number of spots. He's from Coffs Harbour originally but has relocated to Sydney in the past 12 months and has really worked hard on his game." "Will looks like he's really matured physically. He's a poised, great utility type of player who can be used in a number of positions. He presents himself as that modern day draftee at his size and shape. He had a bit of concussion a couple of weeks ago but has been given the all-clear by medical staff and we're really excited that hopefully Will can have a good run at it this year given his injury history." "Sometimes you can be guilty of throwing around talented players too much, and it can be detrimental to them. We'd like to use Harrison as a midfielder or defender, but he can certainly play anywhere with his size and shape. He's relocated to western Sydney at the start of the year so he's adjusted really well and he's getting bigger and stronger. We hope he can continue his good from his 17th year into his draft year." "Zach will predominantly play as a forward although he can be used as a tall defender. We've seen him as a lead-up forward who can burn his opponent by moving him around a lot and that's what Zach does. He's very committed to the program, both for the Bushrangers and NSW/ACT. He's really come a long way and is a ripping kid." "Todd is a late developer. We had him listed on our database from four years ago so he was invited to the under-13s and 14s talent programs but he had cricket commitments that he was concentrating on. He's really stepped up this year. He presents as a modern forward who really attacks and jumps at the contest. He probably needs to put a bit of size on, but he pushes hard at the contest as a deep forward." "With a soccer background, Max has only been playing AFL for the past couple of years. With his size and shape he gets around really well and predominantly gets used as a ruckman. He may spend some time forward as well, which would be really important for Max's development. For someone to grasp the game as quickly as he has and to get to this level is a real credit to him." "Charlie is at Melbourne Grammar on a scholarship and plays with the Murray Bushrangers, and like a lot of players he has come through the system from a very young age. He's draft eligible in 2017. As a midfielder he's a ball magnet. He's an inside/outside player who uses the ball well and probably has one of the best footy brains in terms of understanding the game and knowing how to play it. He's the son of former North Melbourne and Brisbane player Paul Spargo." "Brandon's had some problems with his groins but has spent some time out in recent weeks so is ready to go. He's clean below his knees and makes good decisions when he gets his hands on the footy. He can play as an inside and outside midfielder so gets a good balance into his game. He was an All Australian last year as a bottom-ager." "He's really improved the defensive running in his game. We all know he can run and take the game on, but we've been playing him off half-back and he's really knuckled down. It's put him in more of a position to win his own footy and when he does he's really used his strengths. Over the past couple of weeks he's been really good at TAC Cup level. He's the younger brother of Curtly Hampton at Adelaide." "Tony comes from a soccer background and travelled to America with the NAB AFL Academy in January. We finally got him back on the ground on the weekend after he's battled injury and he played mainly forward, but we'll play him in the ruck this week. His agility on the ground is as good as it is in the air. He can out jump most ruckman and our expectation of him is to just compete, which he likes doing." "Ben is one of our 19-year-old players who has come back this year and improved a lot. He played some really good NTFL football, and he'll play this weekend. We expect him to lead, and he has an ability to run and carry the footy. He can take on taller players when in defence and he's really hard in the contest. 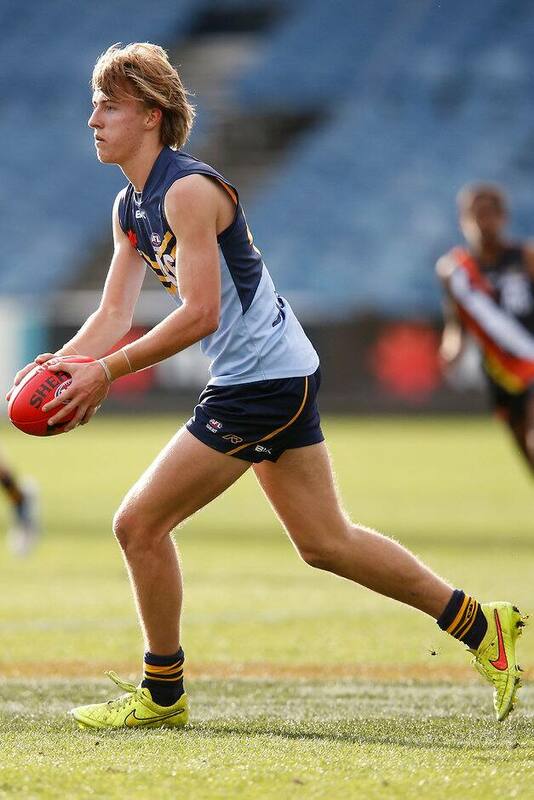 He's the nephew of Essendon great Michael Long." "We call him the Rolls Royce. He's got lateral movement, he's good overhead and he's really worked hard on his contested footy, which has improved. He'll play through the midfield and be our captain. He's had a good run at it this year without injury and has been consistent with his games and training, so this is probably his first chance at having some continuity. He's also starting to fill out a bit as well." "Jacob's had an interrupted pre-season but is starting to find his feet now. He's already shown plenty as a 17-year-old and we think he's a very good player. Because of his size he can play nearly anywhere – as an inside or outside midfielder or back or forward. He's a long kick and very good overhead. We'll give him opportunities as an inside midfielder at the championships." "He didn't play much last year as he hurt his groins but he's got on top of that and he's been in scintillating form. Brad can mark the ball, he's tough at the contest, he can shake a tackle and he's starting to spread from contests really well now. That was the thing he needed to work on. Lately he's also been thrown into the forward line and hit the scoreboard." "Elliot is a bit taller than his brother Harry, who was drafted by GWS last year. He reminds me of Harris Andrews at the Lions. They're not quick but they're light on their feet and they go all day because they have great engines. Elliot is very good overhead, has great agility, keeps his feet and can play at both ends of the ground. He hasn't lived in Queensland long enough to be a member of any Northern academy." "I love tall guys who can jump into a pack and take a mark cleanly, and that's what Connor does. He doesn't double grab anything and he kicks the ball really well. He needs to keep improving his work rate, but he's already shown plenty of exciting things. He stamped himself as a big, key forward in a trial game against Vic Country earlier this year." "He's been really good as an over-ager after being overlooked at last year's draft. He's played as a medium forward in the past couple of years but we've actually given him more time off half-back as a running defender, and in the past two TAC Cup games he's got over 30 touches. We'll keep pushing him through that role and there's a niche for that really explosive defender at AFL level. Nick's got that real power and speed in his game and we'll keep polishing up his disposal." "Ben had an injury-interrupted pre-season and we've been playing him in different roles this year, moving a bit more through the midfield. His possession numbers have been good the past few weeks, which is good given that was a bit of a knock on him that he didn't win enough of the ball. He's one of those players who gets better with more of a workload so hopefully he'll start pushing up the next few weeks. He's the younger brother of the Brisbane Lions' Josh McGuinness."